You're right, Gil. You're right. Thanks Mark. Unfortunately, Kyle isn't a IPMS member ... Yeah, Arthur's a guy ... he's now a farmer in New Hampshire. 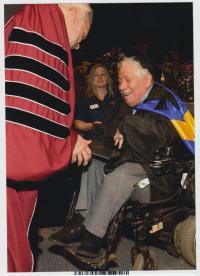 He attended my graduation (my Masters degree) back in May from SNHU. It was a honor having my wingman there. The first day I met Art, he put me in a base pick up truck, an Air Force blue 1969 Dodge ... and took me out to the end of the runway to grade landings ... when the last guy was coming in - a Nam vet, former Phantom driver ... Art reached in back, grabbed a set of earphones and put them on me and got on the radio and said, "Alpha Kilo 1 - 8 ... looking good, and by the way, we have a guest." I looked out the driver's side window and saw the pitot tube of a 106 coming at the truck at about 10 feet off the ground ... it pulled up right over the truck ... WOW!!!!!!!!!!!!!!!!!!!!!!!!!!!!! Another time - he got me some simulator time in the 106 simulator on the base. That was great. Shot down a MiG-21 and a TU-95 ... He was trying to figure out how they could've gotten me up into either the back cockpit of a 106B or the T-33 ... But, ... neither worked out. I can't wait to see the ESSEX and the WW2 63-foot special ops ARB as well as the F-106 and the T-33. You're right, Gil. I am very happy to have them in my possession. And, I've got to tell ya - up close - they're more impressive.